Sunrouge tea is a new special green tea with a high content of anthocyanin’s & catechins ensuring exceptional health effects. 2009, saw the introduction and arrival of a new Green Tea variety in Japan “Sunrouge”. The strain was successfully developed by the National Institute of Vegetable and Tea Science of the National Agriculture and Food Research Organization ( NARO. The aim of the almost 8 year project (2001-2009) was the development of a green tea with a high anthocyanin content and anti – fatigue properties and for a Green Tea typically high in catechins content. Sunrouge tea takes its place in a chain of various Japanese research projects all striving to achieve the same goal; to create the highest possible anthocyanin’s content in food. Similar projects have already been successfully in Japan with purple sweet potatoes ( Murasakimasari to increase liver function ), potatoes and purple rice types ( Murasaki – koboshi ) ( see FIG. 1 , p 321 ) . The variety Sunrouge represents in particular, a number of special Japanese Green Teas – such as Benifuuki and the GABA tea – which are bred or processed to achieve a high content of certain ingredients in their own way. These teas are called from a health perspective “Functional Teas” or “Specialists” who for their very specific health effects and for specific illnesses are outstanding. However in terms of taste, they are less spectacular. It is expected that in the coming years more special Green Tea varieties or specialists will emerge on the market. Development is already underway on a seed variety which will have the highest possible catechin content based on the ” Cha Chuukanbohon Nou 3 ” ( see FIG. 1 , p 327 ). In most conventional varieties of Green Tea ( Camellia sinensis var . Sinensis ) anthocyanin’s can be found, but in a relatively modest amount. An exception to this is the natural Green Tea ” Benibana – Cha “, which produces a distinct anthocyanin’s content in its young buds, flowers and roots . However it is unsuitable for mass cultivation, because it is too fragile and as such less profitable. 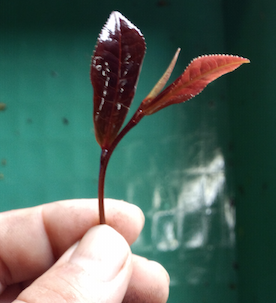 The special seed of Sunrouge tea was created after several years of testing from finally crossing the tea variety ” Cha Chuukanbohon Nou 6 ” ( C.taliensis X C.sinensis ). Sunrouge provides a unique blend of the highest anthocyanin content, significant catechin content and a good production capacity ( see FIG. 4 ) . Sunrouge tea is grown in a very limited part of Japan (as of 2015), mainly on the small island of Tokunoshima, in the Kagoshima province in southern Japan. The subtropical climate produces ideal conditions for this special seed strain. On the global market there is only small amount available however given the first research results and its high functionality, this is likely to change soon. Yet in any case it is very difficult to obtain. The young leaves of Sunrouge are characterized by a clear, beautiful red color which indicates the strong presence of anthocyanin’s. The standard variety Yabukita on the other hand, has the classic bright green normally found in Green Teas ( see figure below). The leaves and buds like other Green Tea varieties are picked and processed in various harvests. In southern Japan the first picking takes place approximately on April 20, the second harvest takes place around mid-June and the final pick at the beginning of August. To stop the oxidation fermentation process the freshly harvested leaves are steamed gently and then dried. Research shows that the anthocyanin’s content in this form of this tea processing remains undamaged ( see FIG. 1 , S. 324 u . 326 ). Anthocyanins (Greek : Anthos – flower, kyanos – blue ) are members of the flavonoid group of phytochemicals and are color pigments which only occur in the sap cells of higher plants mostly in the leaves, stems and roots. The task of anthocyanin’s is predominantly to protect the plants from UV radiation, from insects, bacteria, fungi and free radicals to bind in the cell sap (antioxidant). They are also involved in the regulation of hormones in enzyme activities and involved in gene expression ( see FIG. 5 , p 11 ) . They are highly soluble in water, which means its highly compatible for tea preparation. They also have low toxicity and can be enjoyed in larger quantities. However, the body can only absorb a low amount of anthocyanins from a normal diet (see below). Anthocyanins consist of more than 400 compounds with several subgroups. In nature, you find most often anthocyanidins: delphinidin, cyanidin, petunidin, Peonidin, malvidin and pelargonidin. Above all, cyanidin and also delphinidin are the most widespread. Cyanidin (Cy) is the most common anthocyanidin, and cyanidin-3-O-glucoside (Cy3glc) the most common anthocyanin. The exact effects and benefits of Sunrouge teas are only just being discovered. In Japan numerous studies are being conducted. The consumption of anthocyanins rich foods and especially Sunrouge tea have been attributed to an important number of positive health effects. It must however be emphasized that the Sunrouge tea is especially rich in Delphinidin, a special group of Anthocyanins. These occur in the other foods rich in Anthocyanins such as dark berries, but only in relatively small amounts. In addition, there are indications that the Delphinidine occur in the tea leaves in a different configuration, as is the case of Anthocyanins in other foods, or it could simply that they are more stable and less heat-sensitive in tea and therefore their benefits can be felt more easily (see FIG. 8 .). This and the fact that it’s is also relatively rich in catechins is a strong indication of the special effect of the tea. 11. Anti-diabetic benefits through anti-hyperglycemic effect (cf.. 5., S. 19 and 8.). The first studies indicate that the Sunrouge tea has specific health effects, not only because of the specific content of anthocyanins, but far more importantly the combination of relatively high and specific catechin content. Sunrouge tea is rare and in addition to having conventional catechins, it is one of the few Green Teas to have methylated catechins. This can not be found in any other anthocyanin-containing foods. The combination increases the antioxidant effect, and it opens up new and more potent effects (see. 8). An interesting study by Lin et al. (2) from 2102 showed in animal experiments for example, that the combination of Anthocyane and catechin containing tea has a strong anti-proliferative effect on cancer cells, as was already the case in catechin pure green tea. In addition, the combination led to greater awareness for radiation therapy. The researchers drew the conclusion that, if necessary, the dose and thus the side effects of radiotherapy for cancer could be reduced as a result. Investigations by Yamamoto (see FIG. 6) showed that the AChE inhibitory effect of anthocyanins in Sunrouge tea is strengthened by the special methylated catechins (EGCG3 “Me) and EGCG. This could help to explain the particular efficacy of the tea for various eye problems. Animal experiments conducted by Murakami (see FIG. 7) demonstrated that Sunrouge tea can have a potent anti-inflammatory effect on inflammatory bowel disease, in particular ulcerative colitis. While the catechins of conventional green tea, usually obtained from the Yabukita seed variety, reinforce such intestinal inflammation, Sunrouge showed a protective and anti-inflammatory effect. Additional the hepatotoxicity of catechins, which usually becomes noticeable above certain doses was also significantly reduced. Research into the making of Sunrouge tea has shown that combining catechins with the Delphinidinen complex produce anti-oxidative and anti-stress effects. In addition, the anthocyanins considerably more stable (see chapter 8). Most anthocyanin’s are found in the Aronia berry (about 200-1000 mg / 100g Cy3gal, Cy3glc, Cy3ara), black elderberry, Sambucus nigra (about 200-1000 mg / 100g Cy3glc, Cy3sam, Cy35d-GLC), eggplant (about 750mg / 100g Del3glc, Cy3rut, Del3rut, Nasurin, Pel3rut), blackcurrant (about 130-400 mg / 100g Cy3rut, Del3rut, Del3glc, Cy3glc) and in blue and blackberries (approximately 50-326 mg / 100g Cy3glc) (cf. . 5., p 9f.). Depending on the plant, sub-locations, UV intensity, ripeness, storage, fertilization, soil type, weather varying amounts and concentrations of anthocyanin’s can be found. According to some studies the anthocyanin content can also vary for example in red grapes from between 6-751 mg / 100g, sweet cherries have a range of 2-450 mg / 100g and black raspberries between 197-700 mg / 100g (see FIG. 5, S . 9f.). Also differing lab methods can also lead to this variations so this has to be taken into consideration when examining the differences. The so called popular bottled berry juices, are another anthocyanins source but only on a very limited basis. Studies have shown that significant damage is done to anthocyanin during production and storage (see FIG. 9, p 13ff.). When grinding, pressing and juicing the cells of the berries are destroyed creating a target point for a chemical reaction with other ingredients. The resulting “berry-mash” is heated and given an enzymatic treatment. Through these enzymatic (Most oxidation) and non-enzymatic (condensation & polymerization) reactions comes polyphenolic protein and saccharide bonds. Worst of all is the impact from storing the juice. In one study, only 4% was found in an elderberry nectar (!) as opposed to the levels found in fresh berries (see FIG. 9, p 27). Similarly, such statistics can be found when measuring the antioxidant capacity of the juice (see FIG. 9, p 79). There is a wide range of results depicting the daily intake of anthocyanins through every day food. Statistics range from 0-215 mg per day. In the main seasons for berries, grapes and stone fruit, this can also reach several hundred mg daily. The range will of course vary by seasons and individual diet (see FIG. 5, p 20). It is striking to note thought that at least 10% of the German population consumes little to no anthocyanins (see FIG. 5, p 20). In addition to dosage it is also very important to understand how well or how little anthocyanins can be absorbed and metabolized by the body. Recent studies have shown that there is a relatively poor bioavailability. In human trials, the recovery percent from the added anthocyanins in the urine and plasma amounted to only 0.004 to 0.23% while in animal experiments about 0.3-1.2% (see FIG. 5, p 21). But this varies considerably depending on the relative anthocyanin. For Cy3glc, which for example can be found in black elderberry, nearly 8.5% was found (see FIG. 5, p 92). Research by Fleschhut in 2004 suggest that anthocyanins are taken in by the body through the oral mucosa, the stomach and the small intestine (see FIG. 5, p 90). Until then absorption through oral mucosa and the bowel had been questioned and debated. Studies also showed that the co-administration of sucrose (disaccharide) or the intake of anthocyanins to indigestible food recording slowed (see FIG. 5, p 91). Anthocyanins are only absorbed in small amounts and then metabolized in a relatively short time or excreted. The half-life of different anthocyanins in humans lasts only about 0.8 to 2.2 hours, the highest plasma concentrations occur after about 1 to 2 hours and after 24 hours studies showed that them no longer to be evident in the body (see FIG. 5, S. 21). In a study by Natsumi the content of anthocyanins, catechins and caffeine in Sunrouge tea leaves was compared to the most widespread Japanese Green Tea variety – Yabukita. Results showed that Sunrouge had a much higher amount of anthocyanins, while Yabukita had little to none. While the catechins in Yabukita were found in higher levels, however, the catechin content of Sunrouge was still significant (depending on the time of harvest approximately between 70% and 90% compared to Yabukita). The caffeine content of Sunrouge was also slightly higher than the Yabukita. Depending on the time of harvest, different content levels can be found. Anthocyanins levels in Sunrouge tea in% d. Tr. Examining closer the composition of individual anthocyanins in Sunrouge teas from a study of NARO, Japan, in 2011, the particularly high content of Delphinidinen becomes striking. They are significantly larger than the proportion of cyanidin glycosides, approximately in the ratio 72-79 Delphinidin to 28-21 cyanidin, depending on the time of harvest and leaf age. Amounts in the stems show a ratio of about 89 to 11, the highest delphinidin content. The study also shows significantly higher anthocyanin content in the third harvest. Here even levels of 3,09mg / g are achieved, of which around 75% is Delphinidine. Source: NARO (National Agriculture and Food Research Organization), Japan. It has been proven that the anthocyanins are very soluble in water in general. In experiments by the Nippon Paper Group (see. 8) it was found that from about 70 ° C and a resting time of 5 minutes the majority of anthocyanins and catechins of Sunrouge tea passed over. Assuming a solubility of about 80% from a resting time of 5 minutes at about 70-75 ° C , one could from a tea, prepared with 2 good teaspoons (about 3g), one could expect to pour about 50mg of anthocyanins and in particular Delphinidine. This considerable level is worth noting. Source: 1, p. 325. It must also be emphasized that Sunrouge is one of the very few Green Teas where methylated (catechins EGCG3 “Me and EGCG4” Me) can be found. This is normally found mainly in Benifuuki. 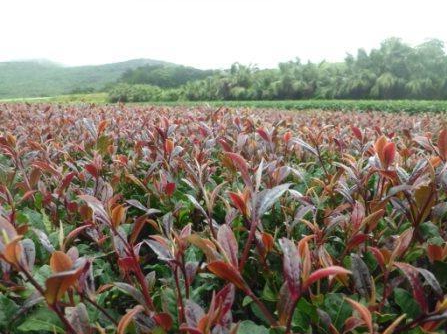 Sunrouge tea has a high anthocyanin content, which becomes even more pronounced especially in late harvests. Striking to note are the levels of Delphinidine. To achieve the highest possible content of anthocyanins, a late harvest should be taken into consideration when buying. The highest anthocyanin content will not be found in the young buds, but in the first leaves of the second crop. Since hardly any tea farmers will consider using this for their tea you should look for Sunrouge tea coming from a later harvest. In addition, the tea is supposed to act as harmoniously as possible in its composition and this should reflect the different mixture of leaves from the late harvests. Ideals are the young leaves of the third harvest from mid-late July to early August. At the same time, the late harvests have a fairly high catechin content, comparable to a first Yabukita harvest. Given the extremely small amount of cultivation of Sunrouge in Japan, it is hardly realistic to find large quantities of the tea on the market which consists only of the third harvest. Totally acceptable though is a Sunrouge tea, which has been put together as a blend of the three harvests and as such as has at least a share of about 30-40% of the third harvest and 30-40% of the second harvest. Sunrouge has a significant caffeine content and is among the top third in Green Teas. For the health conscious but this is not bad news. Caffeine in Green Tea is known only to be potentially less advantageous for very caffeine sensitive people, pregnant women and young children, for everyone else it acts as a performance enhancer and strengthens the body. Anthocyanins are sensitive to heat. Therefore its preferable if Sunrouge Tea are dispensed at the end of the manufacturing process at the final drying / roasting. Such tea is called “Aracha“. Aracha nevertheless needs to be dried properly to attain sufficient durability. 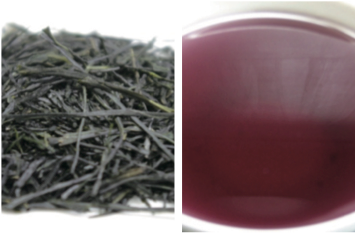 Sunrouge tea releases its anthocyanins only at temperature of about 70-75 ° C into water. Lower temperatures results in a rather watery tea. However a long steeping time and 70-75 ° C drawing temperature enables a lot of rather bitter substances to steep into the water, which can then become unpalatable. Infuse for 2 minutes (for a harmonic tea without any specific therapy benefits), 5 minutes (in order to achieve therapeutic effects). Lastly sprinkle some lemon juice. To achieve a significant health effect it is generally advised to take as a cure daily over several weeks. Depending on the medical problem or purpose though, this tea can also be taken up to twice a day. Generally it is advised that Green Tea should not be drunk on an empty stomach. To promote rapid and better absorption of anthocyanins through the oral mucosa and the stomach, the Sunrouge tea should be taken with a good break between meals. It is also advantageous to keep the tea a little longer in the mouth than with other standard Green Teas. One special feature of Sunrouge becomes apparent when you add some lemon in the finished brewed tea. While it not only improves the taste it creates a clear red coloration. The Sunrouge reacts with the acid of lemon. Depending on the degree of acidity (pH), the tea becomes stained in various ways. At very low pH value (pH 1-3) creates a strong red color while an increasing pH leads to a less intense and finally colorless tea. From a pH of 6, the tea becomes the purple color, while anything above a 7 a deep blue will occur (see FIG. 5, page 4). 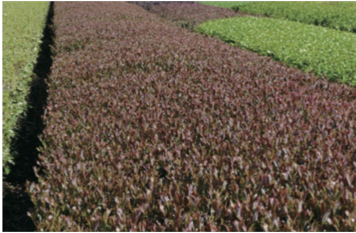 Differing composition of anthocyanin’s will reflect in the pH values a different color. The anthocyanin’s remain stable at low pH values, so that the addition of lemon also makes sense in terms of its effect (see FIG. 5, pp. 6f). The aroma and is in general is less intense and reminiscent of hot water with a dash of lemon. Also, the astringent, almost dry feeling and the bitterness of lemon water is very similar. It’s has more of a health tea taste as opposed to the normal distinct taste of tea, however its lemony, tart flavor is still a nice change to standard Green Teas.